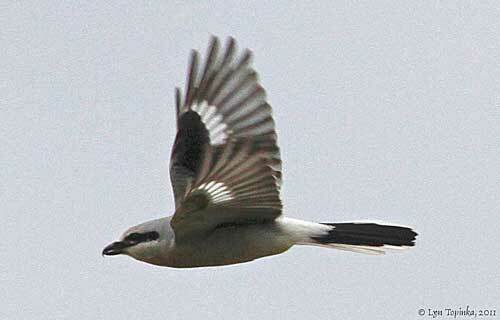 Adult Northern Shrike. Photo © Lyn Topinka, courtesy Ridgefield National Wildlife Refuge. Ansel Adams would have loved the Fill today. The soft sun of an October morning shed its light on the groves of trees surrounding the ponds, creating deep shadows contrasted by the bright leaves just beginning to turn to gold. Adams’s great artistry as a photographer was his ability to capture these contrasts of light and shadow. But although he loved all the colors of nature, Adams preferred to express himself in black-and-white. It wasn’t just that the color photography of his day was too primitive to represent nature accurately. For Adams, black-and-white exposed the inner meaning of nature’s beauty, allowing viewers to understand nature more deeply. The stark beauty of black-and-white was on full display here today, embodied by one small bird who flew across the yellow-brown fields of Hunn Meadow to perch in the Triple Tree near Main Pond. A Northern Shrike has brought its beauty from the Far North to grace the Fill for a time, a living monochrome framed by a backdrop of autumn gold. This entry was posted in Uncategorized on October 19, 2011 by constancesidles.